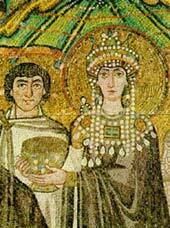 Theodora was an actress, dancer, and prostitute who became mistress, then wife, of Justinian. When Justinian succeeded to the throne in 527, she was crowned empress and became the most famous and powerful woman in Byzantine history. Theodora received foreign envoys and corresponded with foreign rulers. She played a major role throughout Justinian’s long reign, and probably saved his throne during the riots in 532. The important role she played is evidenced by the fact that little legislation dates from the period between her death from cancer in 548 and that of Justinian in 565. 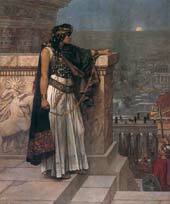 Zenobia, called ‘’The Queen of the east’’, was the ruler of the Greek – Arab state of Palmyra in Syria. She was the wife of the King of Palmyra; after her husband died she became sole ruler. When her armies occupied Egypt the emperor Aurelian sent an army to stop her. Zenobia was defeated and Palmyra subjected by the Romans. Zenobia was captured but made such an impression on the emperor that he set her free and gave her an estate near Tivoli. Lady Murasaki Shikibu was a court lady, and author of the ‘’Genji monogatari’’ (Tale of Genji, c.1010), generally considered the greatest classic Japanese literature, which is thought to be the world’s first novel. The tale of Genji was called ‘’a sensitivity to things’’; the hero Prince Genji, is not remarkable for his military exploits but as an incomparable lover, sensitive to each of the women he wins. The story relates of how each woman evokes a different response from this extraordinary complex man. Olga was the widow of Prince Igor I, who was assassinated by his subjects. Olga became regent of the principality of Kiev from 945 to 964. Olga concluded a trade agreement with Byzantine and opened the Russian state to Christian influence after her own baptism. Her grandson, Vladimir I, made Christianity a state religion; together they mark the transition between pagan and Christian Russia.